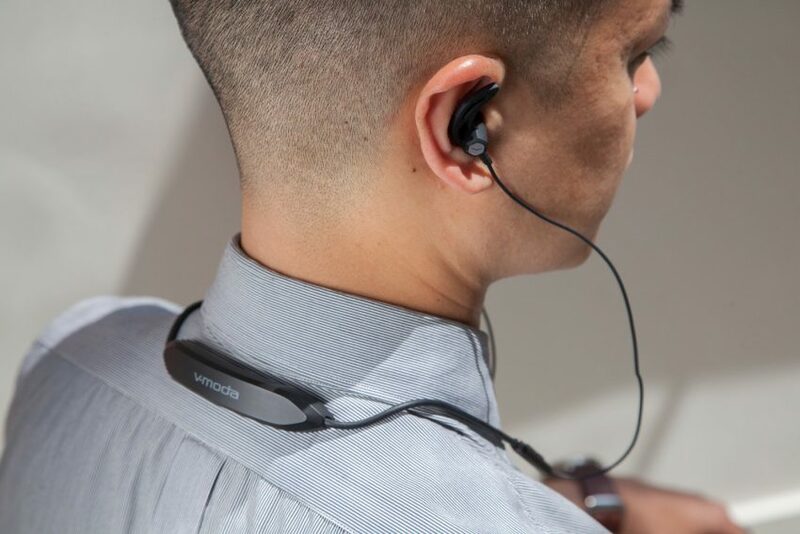 The V-Moda Forza Metallo Wireless headphones offer rich, full audio with a stylish, customizable design. 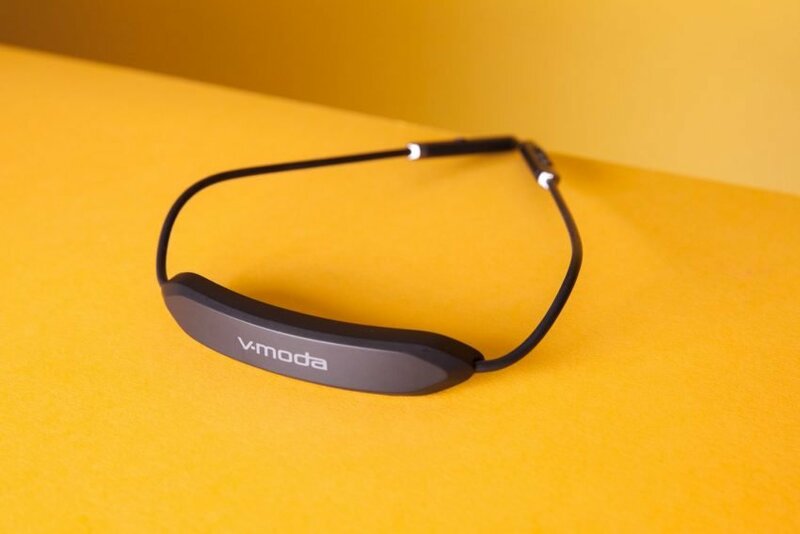 V-Moda, a brand continually inspired by Italian design, has become quite well-known over the past few years for combining great sound with exceptionally stylish designs. The company’s newest in-ear release is the Forza Metallo Wireless, which adds Bluetooth wireless functionality to an already great-sounding pair of earbuds. Does this newest wireless addition match up to V-Moda’s high standards? After hours of listening, here’s what we found. 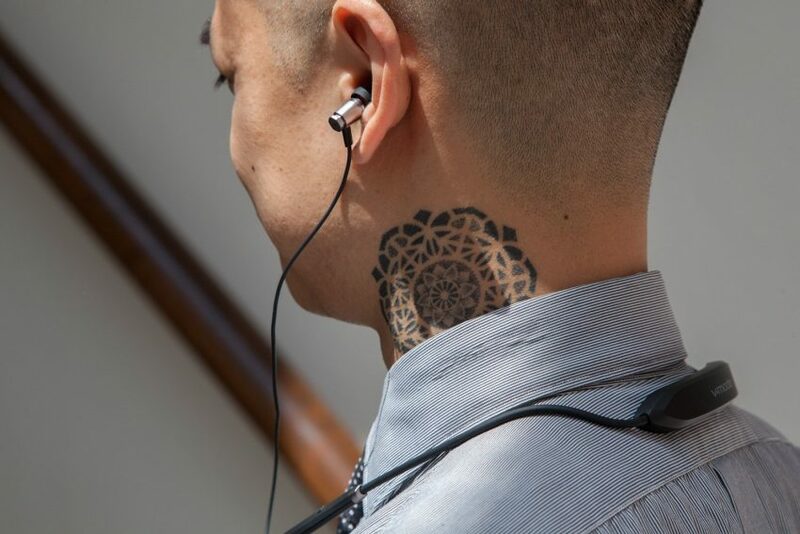 V-Moda has taken the small, hexagonal, metal earbuds from the original Forza Metallo and paired them with a trendy neckband design. The company hasn’t strayed from its early design cues, using metal rather than plastic, to give both a stylish look and acoustic superiority. The actual earbuds are made from aircraft-grade aluminum with the same hexagonal design and 5.8mm neodymium micro driver as the non-wireless version has. The battery, antenna and electronics are contained in a 4-inch, curved, plastic module designed to sit on the back of your neck. When a phone call comes in, this module will vibrate to draw your attention. In addition to looking good, the Metallos can take a bit of a beating thanks to a sweat-proof durability rating that means they can be used both inside the gym and out. And while these headphones are not waterproof, you can gently rinse them off under a water fountain. V-Moda handles cable management with its TrapLock feature, which adds titanium cable stays to form around your neck for ergonomic comfort. 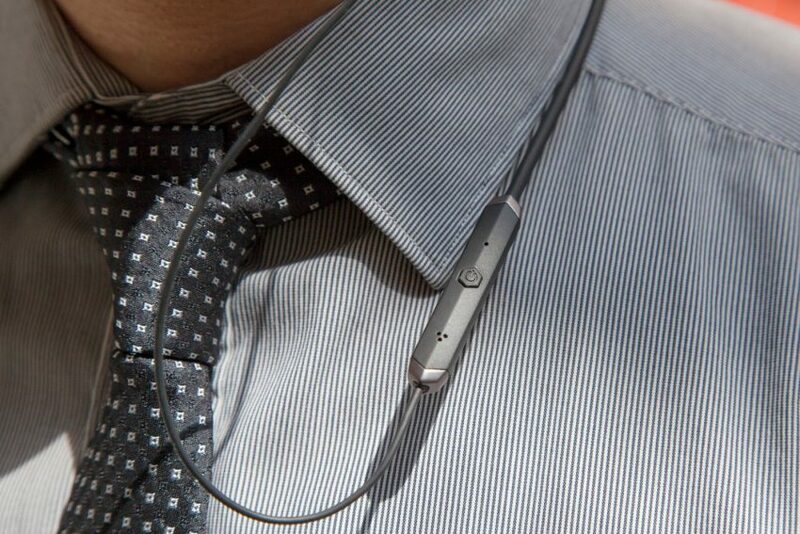 Moving toward the earbuds is a roughly 2-inch plastic pod that contains the in-line control buttons and mic on the right and a dual-function power and Bluetooth-pairing button on the left. 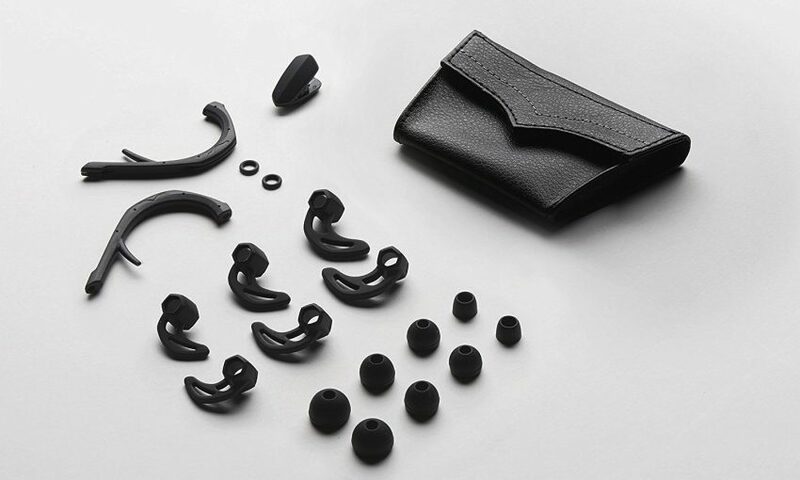 Included in the box is an assortment of accessories, including eight pairs of ear tips in XS, S, M and L for an accurate fit. Three pairs of ActiveFlex rubberized sport fins used to lock the earbud into the ear canal are also included. It just wouldn’t be a set of V-Moda headphones without some set of customization options. Similar to the company’s on- and over-ear cans, the Metallos let you trick out your buds with 3D-printed endcaps. You can make the stylish accessories from a variety of designs and precious to semi-precious materials including Platinum, 14K Gold, Gold-Plated and HD Acrylic, which range between $20 to $7,500. This is a bit steep considering the Metallos cost only $170. To test comfort and fit, I pitted the Metallos against the the Beats X Wireless headphones, which also use a neckband design. Where the Metallos use a round cable with a single hard-plastic module that packs the battery and electronics, the Beats model use a flat, balanced cable with small modules on either side that maintains gentle tension. I found the Beats design to be more comfortable and functional. The Metallo’s cord measures over 38 inches long, compared to the Beats X’s 33 inches. Both are too long in my opinion, but for taller individuals with long necks, this may be fine. If you have a shorter or average-size head, you may find there’s too much cable flopping around against your face. With all the weight behind my neck plus the long cable, I found the module would occasionally slide down between my shoulders. 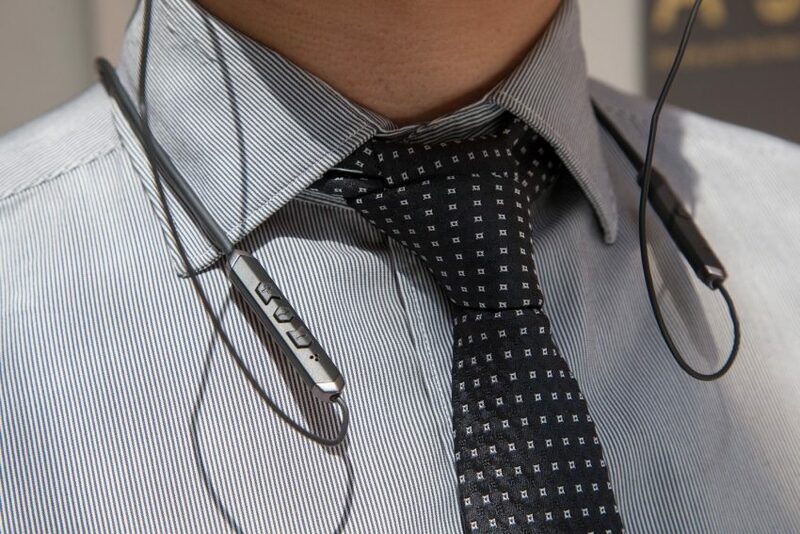 The placement of the two smaller pods, which contain volume, track control and mic, was also too far back on the cable, making it awkward to use. I did, however, really enjoy the actual fit of the hexagonal earbuds right out of the box. I added the medium-sized silicone ear wing, which really does lock the earbuds in place. Unlike some earbuds, these do not protrude from your ears too much, and they still block out a good deal of sound. V-Moda headphones are typically tuned with a bass-forward sound, but the Metallos are quite natural-sounding and certainly did not disappoint. 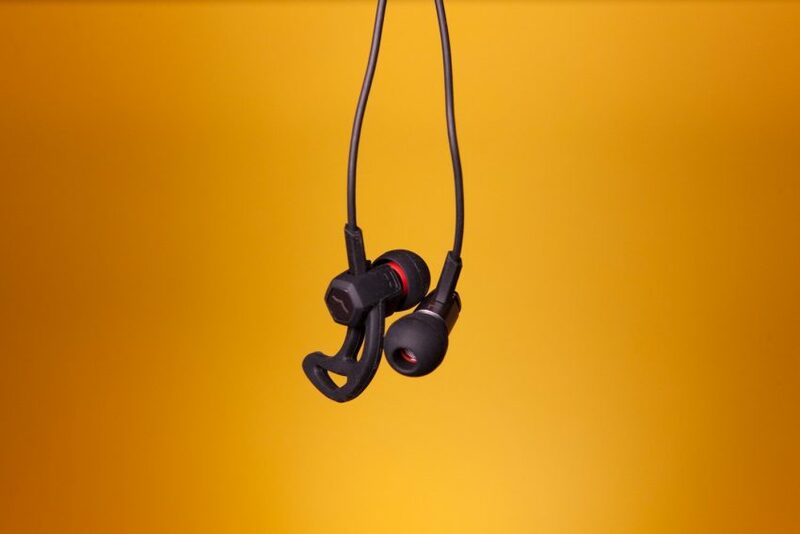 Given the diminutive size of each earbud, with its 5.8-millimeter driver, they were surprisingly precise, offering tight and accurate bass, natural-sounding midrange and bright highs that offered plenty of headroom to provide great sonic detail. Flo Rida’s “GDFR” (Goin’ Down for Real) with its falling synthesized bass sweeps is typically a challenge for most headphones, but the Forza Metallo Wireless reproduced it seamlessly. I wanted to hear how these headphones performed with a standing bass, so I played Holly Cole’s version of “I Can See Clearly Now,” which was so clear and detailed that you could hear the strings vibrate when they were plucked. The live version of Monte Montgomery’s “When Will I” beautifully highlighted the artist’s fast picking up and down the neck of his beat-up Alvarez guitar. To test the upper register, I played Cyndi Lauper’s 1983 hit, “All Through the Night,” which begins with an ethereal and delicate intro sequence. Unsurprisingly, these earbuds delivered the elegant and lighthearted sound the song is meant to have. After following the instructions to charge the Metallos for an hour prior to use, you simply turn them on to put them in pairing mode. A quick search on my Android phone’s Bluetooth menu found the V-moda Forza, and they were connected, acknowledged by the audio tone. V-Moda claims the wireless version of this model gets up to 10 hours of playback at regular volume after a full charge. Like the Beats X, the Forza Metallo Wireless headphones employ a fast-charging circuit, adding 2 hours of playback after only 15 minutes of charging — perfect when you’re about to get on a flight or run out the door. The Metallos lasted about 8.5 hours; that’s a little less than the suggested 10 hours, but about what I expected since I was playing at a higher volume. According to the website, the Forza Wireless are good for 33 feet of wireless range. I walked all over my 900-square-foot apartment without experiencing any major connection issues, with the exception of when there were three or four walls between the earbuds and the phone. V-Moda’s $169 Forza Metallo Wireless leave me with somewhat mixed feelings. Like all V-Moda products, the Metallos really impressed me with their sound and comfort. They provide full, rich and detailed audio without being over the top in any frequency range. But I’m really not a fan of V-Moda’s implementation of the neckband design. It’s a bit cumbersome and uncomfortable for shorter individuals, with enough slack on the plastic module that it slides down your back. The Beats X are somewhat cheaper, at $139, and are more ergonomically designed. Overall, though, if you want a stylish pair of headsets with great sound, the V-Moda Metallo Wireless are a good choice.